Thanks to Ruth and Stacey for hosting Slice of Life Challenge 2013. Today is one of those days that only chocolate cake is going to be able to fix. Ever have those days when you feel like you can't be stretched in any more directions? Today is one of those days for me. I know that I'm not supposed to eat chocolate cake to make myself feel better. Tomorrow, I'll probably feel bad that I succumbed to my weakness. But for tonight, I'm going to sink my fork into deep, dark chocolate cake with thick fudgy icing, savor it slowly, and enjoy the moment. Sometimes you just need cake. I made and enjoyed one yesterday! Actually, I had another piece for breakfast! Enjoy yours. Mmmmm, that looks so good. Guilty pleasure would have to be frozen custard concretes or maybe an Elvis cupcake (banana cake, peanut butter ganache and pb icing). Hope tomorrow's a better day. I have to say that cake looks yummy. My guilty pleasure of the last few months has been chocolate fudge brownie ice cream. Amazing! Yum! My guilty pleasure, though I don't feel all that guilty, is certainly chocolate. During Easter, I eat a lot of "Oh Henry!" eggs. Why do treats always make us feel better? Cake sounds awesome! My guilty pleasures always end up being something sweet- ice cream or Panera chocolate chip cookies. Cake. Chocolate cake. 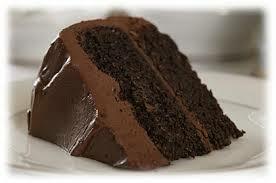 Reading about chocolate cake makes me want chocolate cake. I'm a dark chocolate lover. I enjoy eating it and I don't feel guilty. I say eat cake and don't fret about it. I hope your week gets better! Chocolate anything! That cake looks delicious. Oh, I did this on Sunday! I am not one to go out and buy a piece of chocolate cake, but I needed - wanted- had to have it. It was delicious. But you know what? I didn't really feel that great after devouring it. Hmmm. . . if chocolate cake can't do the trick anymore . . . maybe a little exercise would make me feel better! Chocolate is my drug of choice too. But I like anything sweet. With coffee. And better if there is someone to talk to and enjoy it with!